Shefford Town & Campton’s championship hopes were dealt another blow when they lost their unbeaten home record 3-1 third place AFC Oakley M&DH on Saturday. Ahead in the Premier Division supported by Sportsform fixture via a goal from Andrew Hayday, the visitors via a strike from Alex Liburd plus an own goal were to lead the contest 2-1 at the half-time break before the points were sealed on the hour mark with a third goal from Mark Smith. With second place Renhold United having their game at Wootton Blue Cross postponed, for fourth place Flitwick Town it was an extension of their unbeaten ways to seven games when a lone goal from Daniel Stafford was enough to earn them all three points from a 1-0 win at Pavenham. Over at Lodge Road, visitors Sandy were twice required to come from behind to earn a share of the spoils in a 2-2 draw with Sharnbrook to take their unbeaten record up to six games, Hayden Jones and Shaun Barnett on the home scoresheet against replies from Phill Beall and Jahrome Mullings. Whilst just down the road at Sharnbrook Upper School, Eastcotts AFC ran out 3-0 home winners over Caldecote. Travis Joseph netting twice including one from the penalty spot alongside a strike from Harvey Puddifoot. The biggest win of the day belonged to Wilstead who ran out 7-1 home winners over second from bottom of the table Lidlington United Sports. Paul Jones, Colin Marshall and Adam Budek all netted twice alongside a single strike from Kieran Brasier against a lone reply from Carmine Cientanni. Bottom of the table Ickwell & Old Warden ended a run of four consecutive away defeats by winning 4-2 at AFC Kempston Town & Bedford College. Zak Rowe with a brace plus single strikes from Lee Threadgold and Joe Stevens did the damage, being replied to by Joe Hubbard and Alex Russell for the Town. It was an end to league leaders’ Elstow Abbey’s six game winning run when they were held to a 2-2 home draw by second from bottom of the table Marabese Ceramics. Ahead in the 13th minute via Danny Pilgrim, a penalty from Joe Follano 14 minutes later drew the Tilemen level. Tom Pitts in the 67th minute shot the home side back in front only to see Follano net his second goal of the game two minutes later to earn his side a share of the spoils. It was not all doom and gloom for the Abbey as second place Henlow were beaten 3-2 at home by Great Barford to in fact increase Abbey’s lead at the head of the league table up to two points. Gary Canzano, David Mulvhill and Elijah Hukin were on the scoresheet for Great Barford to take their unbeaten ways up to 10 games against a brace in reply from Matt Wilson. However, the Abbey will be aware that they are now just six points clear of third place Cranfield United who have played three games fewer after United made it six wins on the bounce with a 5-1 victory at Bedford SA. James Armstrong scored a brace plus strikes from Martin Holland, Jake Brown and Matthew Goss brought up the nap hand against a lone home reply from Paul Nigro. Over at Hillgrounds AFC Kempston Town & Bedford College Reserves were 3-1 home winners over Queens Park Crescents to end the visitors’ unbeaten run of five games and still leave them looking for their first away win of the season. Harrison Ellis, Ashley Windridge and Anas Bechkoum were on the home scoresheet against a lone reply from Shazad Sattar. Elsewhere it was a red letter day for bottom of the table AFC Harlington who gained their first away points when winning 3-0 at Shefford Town & Campton Reserves who have now lost their last six outings to drop into the bottom three. Scott Gadsden, Jon Murray and Sam Johnson netted the vital goals. Whilst for Potton Town it was a 2-1 home win over Meltis Albion. James Pyman and Bradley Smith seeing their goals only replied to once by Calum Stuart. The final game of the day in this division saw sixth place Riseley Sports take their unbeaten ways up to five games by sharing the spoils in a 2-2 draw at AFC Oakley M&DH Reserves, Stuart Kelly twice scoring for the home side against Sports replies from Karl Walker and Jamie Simmons. With second place Westoning having their home game against Elstow Abbey Reserves postponed, Clapham Sports duly increased their lead at the head of the league table up to four points by winning 6-1 at Wootton Village. Their eighth win on the bounce came via Sam Maddix with a hat-trick, Grant Williams with a brace plus a strike from Marko Espozito against an own goal in reply for the Village. Now up into second spot on goal difference having played the same number of games as Westoning but four fewer than the leaders are Stevington who chalked up their tenth consecutive victory in winning 14-0 at second from bottom of the table Caldecote Reserves. Joe Holyoak, James Bourke and Jordan Wright all netted hat-tricks, Kieran Souter a brace to go with single strikes from Ben Walsh, Tristan Clarke and Aaron Fletcher. The home side’s cause not helped by a red card for Jamie Saunderson 15 minutes from time. Also winning big were Moggerhanger United who ran out 7-2 home winners over Kempston Athletic, Dean Hill and Brandon Bates netting twice to go alongside single strikes from Jason Kinns, Lee Adams and Steve Bains against two in reply from Adam Moloney for the Athletic. For Marston Shelton Rovers Reserves it was a third win on the bounce with a 4-0 home win over Meltis Albion Reserves who were suffering their fifth consecutive defeat. Gary Russon with a brace plus strikes from Jake Cullum and Carl Borromeo did the damage. 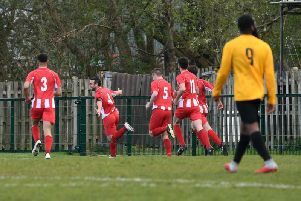 Whilst sharing the spoils were Bedford United and Kempston Hammers Sports from a 3-3 draw., Tom Wade, Aaron Perrett and Guiseppe Lamberti on the United scoresheet against Hammers replies via Kevin Short, Martin Bennett and Jack Breteton. The scheduled Renhold United Reserves v Wilstead Reserves game was postponed. The new leaders are Cranfield United Reserves following their 6-0 home win over Shefford Town & Campton A to retain their unbeaten home record and chalk up win number five on the bounce. Phil Kempsell and Luke Gary both netted twice alongside single goals for Adam Kerr and Ryan Collis. Losing out on that top spot and now in second are Lea Sports PSG whose seven game winning run was ended by going down 3-1 at home to Dinamo Flitwick. Gareth Loadman with a brace plus Jamie Burton were on the winners scoresheet against a lone PSG reply from Ryan Darby. Now just two points behind PSG in third spot are Flitwick Town Reserves who maintained their seasons unbeaten home ways with a 3-2 victory over Clifton, Mark Bartlett, Chris Bull plus an own goal marking the Town scoresheet against replies from Charlie Watson and Jack Brown. Elsewhere, White Eagles retained their 100% away record by winning 2-1 at Atletico Europa thanks to strikes from Rafel Cygan and Jacek Tereszkiewicz against a lone home reply from Vince Bonelli. Whilst also winning on the road were FC Serbia in a 3-2 victory at bottom of the table Mid Beds Tigersm Zdenko Kuhar, Milan Marusic and Demilson Conceicao netting the goals to do the damage against Tiger replies via Steve Monks and Rob Gaylor. Meantime, Ickwell & Old Warden Reserves were running out 6-1 home winners over Caldecote U20. Milo Plater and Marko Tobdzic netted twice to go with single strikes from Kaylen Wilson and Ashley Drummond against a lone reply via Carl Heath. The scheduled Sandy Reserves v Westoning U20 game was postponed.